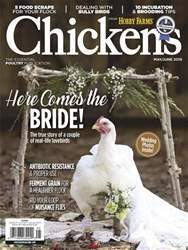 Digital Subscriptions > Chickens > May/Jun 2019 > Scrap It! These five food scraps benefit your flock’s health and your pocketbook. A well-formulated chicken feed is the ideal nutritional staple for a backyard flock of chickens, yet some chicken-keepers enjoy supplementing their birds’ diets with a variety of food scraps. Food scraps might come from your own backyard or local farms, stores, restaurants or friends. Feeding chickens scraps saves money and can provide them with significant health benefits. This article features five food scraps that benefit your chickens’ health. Greens are a healthy food for chickens. They are anti-inflammatory and full of healthy vitamins and minerals. Laura Mikulski, a backyard chicken-keeper and small-farm advocate from Detroit, enjoys incorporating greens into her flock’s diet primarily as a way to prevent ovarian cancer, which chickens can be prone to later in life. Two greens she often uses are broccoli and kale, which are high in protein and contain kaempferol, a flavonoid shown to lower the risk of ovarian cancer. They can be fed cooked or raw. Mikulski feeds her chickens the broccoli bits left over after boiling. “When you steam broccoli, you can even use the water and bits of broccoli that fall into it to mix into chicken feed for a tasty porridge,” says Mikulski, who blogs at www.ferndalechickens.com.